Kirk Goldsberry (@kirkgoldsberry) is a professor and an NBA analyst for ESPN. Stephen Curry had a pretty great weekend. Against Chicago on Friday, he passed Jason Terry to become the third-most prolific 3-point shooter ever. Then on Sunday he made 11 3-points shots as the Golden State Warriors beat the Dallas Mavericks. It was the seventh time in his career that Curry has made at least 11 3s in a game. All other players in NBA history have combined to do that only eight times. At 30 years old, Curry is the best shooter this league has ever seen, and he still has a lot left in the tank. Barring injury, he will own every major shooting record in the sport by the time he retires. Curry trails only Ray Allen and Reggie Miller in career 3s. It's merely a matter of time until he shoots past those Hall of Famers and becomes the all-time king of the perimeter. Curry is halfway through his 10th season in the NBA. It took him only 655 games to catch Terry, who required 1,410 games to make 2,282 3s. Allen made his last 3-point shot in 2014 when he was 38 and playing in his 1,300th game. At his current pace over the past five years, Curry should surpass Allen's mark when he's just 32, and should become the first NBA player to hit over 3,000 triples just a few games later. If Curry stays healthy, there's no reason to believe he won't get to 4,000 or even 5,000 made triples by the time he's done. One of the keys to his greatness is his range. Look at how many of those 3s occur way beyond the arc. Simply put, Curry isn't just the best 3-point shooter ever, he's the best deep 3-point shooter ever. Consider this staggering stat: This season Curry is shooting nearly 54 percent on his 3s between 30 and 35 feet. Keep in mind the NBA makes just 35 percent of its 3s overall, and under 22 percent from between 30-35 feet. You're not supposed to be able to score from out there, let alone at that rate. Another crazy stat: A hypothetical NBA offense that featured Curry launching from 30-35 feet wouldn't just be good -- it would be the most efficient offense in NBA history. These deep shots might only make up a small fraction of Curry's total deep balls, but they prove that Curry has the best range of all time. The mere threat of a deep-range launch from Curry forces entire schemes to adjust. The sample size is small, but the impact is real. One reason Curry has captured America's heart is that we've all tried to shoot. Most of us can't dunk or soar through the air like Michael Jordan or LeBron James, but we can all at least shoot. The most remarkable thing about Curry is that on a planet full of billions of people who have tried to shoot a basketball, one dude is so much better at it than the rest of us, even all the other professional basketball players in the NBA. When the NBA added the 3-point line 40 years ago, nobody could've pictured an MVP and a scoring champion who thrived this way from downtown. Nobody imagined a guy who could hit 45 percent of his 12 3-point tries per game. But that's exactly what Curry is doing this season. Curry's status as the best shooter in the NBA is unquestionable. A quick look at the stats of the NBA's most active 3-point shooters over the past four-plus seasons reveals that Curry is clearly the best long-range scorer in the league -- and it's not close. Since the beginning of the 2014-15 season, when Steve Kerr took over in Oakland and the Warriors took over the NBA, 105 players have attempted at least 1,000 3-point shots. Of that group, Curry ranks first in overall makes and second in efficiency. It's not fair, my dudes. He shoots more than anyone, and with the exception of the ridiculous Kyle Korver, he sinks them at a higher rate. No player in the history of the NBA has combined range, volume and efficiency from downtown as well as Curry, and over the course of the Warriors' dynasty, he has changed the way the entire league looks at 3-point scoring. 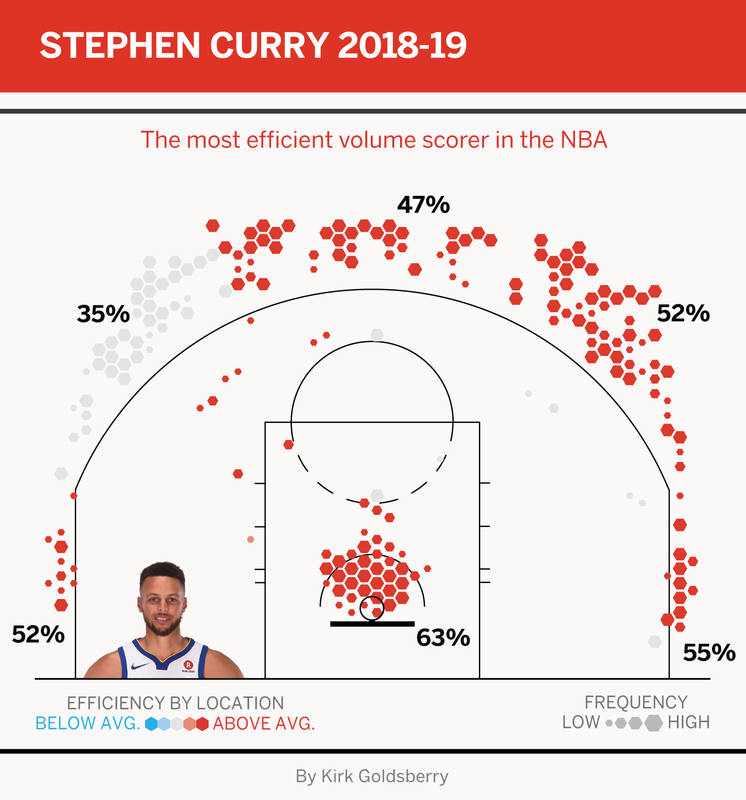 Curry's jumper is so lethal that he has become the most efficient volume scorer on the planet -- of the league's top 20 scorers, nobody has a higher true shooting percentage than Curry. Not even Giannis Antetokounmpo, and all he does is dunk it. Coming into this decade, 3-point shooting was a relatively niche skill reserved for role players or the occasional sharpshooting All-Stars like Allen and Miller. But now shooting is everything, as Curry showed us the 3-pointer can be the dominant shot of the league's most dominant scorers. You might argue that LeBron James is the best player of this decade and Kevin Durant is its greatest scorer, but if the legacy of this decade is the 3, then Curry is definitive superstar of our time.